This simple peanut butter granola recipe is quick, tastes delicious, and lasts a long time. You can make it in about 20 minutes. I love this paired with some plain yogurt although we have been known to eat it as it. What I love about making your own homemade granola is that you can control the ingredients and the amount of sugar that is added. In this recipe I do add honey, but only a tablespoon for the whole batch. Many of the granola brand on the shelves have 2-3 teaspoons of sugar...PER SERVING! 4 cups oats - This is my favorite bran of oats. For any recipe, they won't come out mushy. Preheat oven to 375. Place oats on a cookie sheet and bake ~15 minutes. While baking the oats, place the peanut butter, honey, and coconut oil in a small sauce pan and heat over low until saucy. Remove from heat and add cinnamon oil. 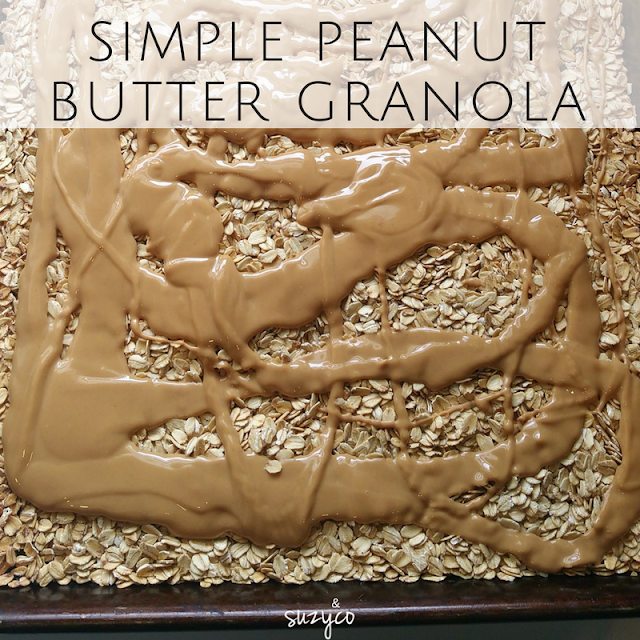 When oats are done drizzle peanut butter mixture on top and stir it all together. For more recipes, nutrition tips, and inspiration for your well-being, subscribe today.